Now these less exotic Laverda twins I’ve admired for a while, and I’ve even seriously considered buying when I can find them to drool over. I might keep an eye on this particular bike, although I’m really holding out for one of the triples… Unfortunately, the three-pot Laverdas are as rare as hen’s teeth in these parts, and the Jota’s are a bit out of my reach financially. Early Laverdas were small displacement sporting machines ranging from 75cc’s to 200cc’s, but Laverda began plans for a big-bore parallel twin to compete with rivals from Harley Davidson, BMW, Moto-Guzzi, and Triumph. 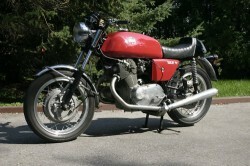 First shown in 1966 as a 650cc machine, it quickly grew to 750cc’s. The 750 SF was fast and reliable, but expensive. Early bikes sported the drum front brake found here, but later this was changed to twin discs. 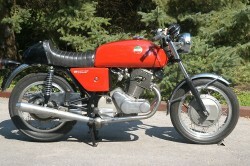 The drum brake is Laverda’s own 9” twin-leading shoe design that led to the name: SF stands for “Super Freni” or “Super Braking”. Famously overbuilt, the 750 twin made an excellent foundation for endurance racers and the brand built its racing fame on long distance competition. In their quest reliability, Laverda used Japanese electrical components exclusively. Designed by company founder Dr. Francesco Laverda, these bikes were built with the highest quality components available. From Ceriani forks to Akront rims to Fiamm horns to Bosch electronics & Nippon Denso instruments; with stainless steel fenders, show-quality paint, and fanatical attention to detail; Laverdas are top quality Italian bikes built literally of the best parts available. 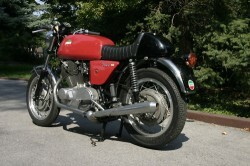 The chain-driven overhead cam 750 cc twin made 61 horsepower and had twin Dellorto carbs and pushbutton electric start. This one’s all original and in exceptional condition with only 3,803 original miles. Ran beautifully and pulled like a tractor when decommissioned for display in a climate-controlled environment in 2001. The bidding is at $3,500.00 with the reserve not yet met and I’ve seen these for sale from about $5,000. Never miss an update with our subscription service. Your address will not be sold or spammed, and only our updates will be sent to you. Classic Sport Bikes For Sale © 2019. All Rights Reserved.